The other hunters and myself gave the custom knives from the Sunrise River Knife Company their first work out this past week end (March 17-19, 2000) at the Texas Big Hog Outing or BHO held on the Reed Wildlife Ranch near Kerens, TX. 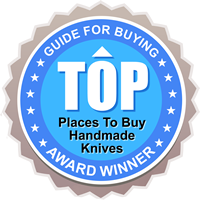 Jay Maines dropped me an e-mail awhile back and asked if I’d like to do a Product Test on a couple of knives from his Sunrise River Custom Knife Company. (www.sunrisecustomknives.com) I said sure and selected for test his #303 Big Game Skinner and his #206 Small Drop Point Hunter. Jay promptly shipped these to me for long term testing. He shipped them with the normal semi finished edge ready for sharpening as the customer sees fit. I sharpened both using a 24 degree bevel and then steeled them in preparation for the BHO. When I arrived at the Reed Ranch I took out the two knives and showed them around to all of the hunters and let them know these knives were available for use by all during the BHO as we wanted to give them a real test. Most everyone who handled the #206 Small Drop Point Hunter fell in love with it but the reception to the much heavier #303 Big Game Skinner was less warm. Folks liked the lightness and easy handling of the Drop Point so much better. All agreed both were nicely done and that workmanship seemed first rate. The real test was yet to come. Success on the hunt was a bit less than we had hoped for but still a total of three hogs were taken. The first was taken by Malcolm and he chose to use the #206 Small Drop Point for the gutting and skinning chores and then later for cutting it up to place in his cooler for transport also. I was able to twist his arm to try the #303 Big Game Skinner but he soon went back to the Drop Point. Said the light weight and easy handling were the over riding considerations for him. Next up was a sow killed by Alec and Carl did the chores on this one for his young friend. Carl also was insistent that the #206 Small Drop Point was the knife of choice. If you are beginning to get the idea folks fell in love with this one then you are 100% correct as they sure did. Last up was my big GrayGhost Whumpus Hog and my good friend Kevin volunteered to do the honors since he has done the job on a few hundred hogs in his time. Who was I to argue? Kevin also chose the #206 Small Drop Point Hunter for the full job from gutting to skinning to cutting it up for the coolers, yes it was large enough to take two coolers. Kevin even used this knife to cut thru the entire ribcage and afterward found the knife still sharp enough to continue cutting however he didn’t argue when I took it and steeled it again after such abuse. At no time during the full work on three hogs did the blade require any work other than an occasional use of the steel to touch up the edge. Even after I got back home and used it to complete the processing of my hog I still have only used the steel and not had to touch it to a stone again. Just how long will it keep going? I don’t know but am willing to find out. My preliminary report on the Custom Knives from Sunrise River Custom Knives and made by Jay Maines is very positive. All who used them were happy with the performance and wanted to know if as field testers they were going to get a special “field tester” price on one. I believe if Jay had sent along a few extra of the #206 Small Drop Point Hunters I would have been able to sell some for him. They were that popular with the crowd at the BHO. More testing (use and abuse) is ahead. Jay told me to take my time and use and abuse them and let him know how they hold up. For now they are holding up great. I still want to do some more testing of that #303 Big Game Skinner as I’m convinced that it is a good design even if heavy. That extra weight and strength is sorta what attracted me to it in the first place so I will use it even if my hunting companions at the BHO were knife wimps and wanted the cute and light weight Small Drop Point Hunter. It is might nice however so I do understand their attraction to it. More testing to come but for sure the #206 Small Drop Point Hunter has already earned the Graybeard Seal of Approval for its exemplary performance at the BHO.